I converted an old garment bag into a plastic bag holder. I put a clothes hanger in the hole of the garment bag and hung it on a hook in my garage. I zipped it up about half way and crammed all my plastic bags in it. The more bags I get the further up I'll need to zip it. 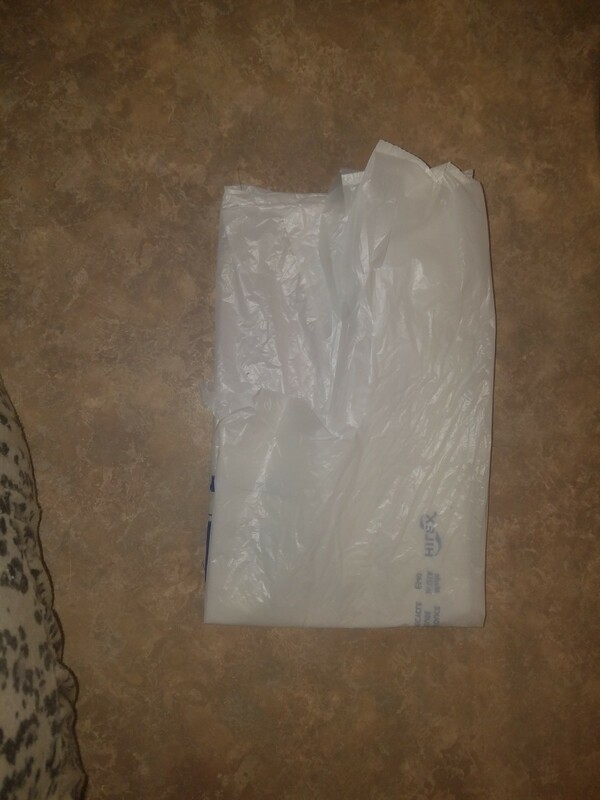 I found that if I take a plastic bag and smooth it out and fold it up small, I can get several into a large prescription bottle which then goes in my purse or tote. 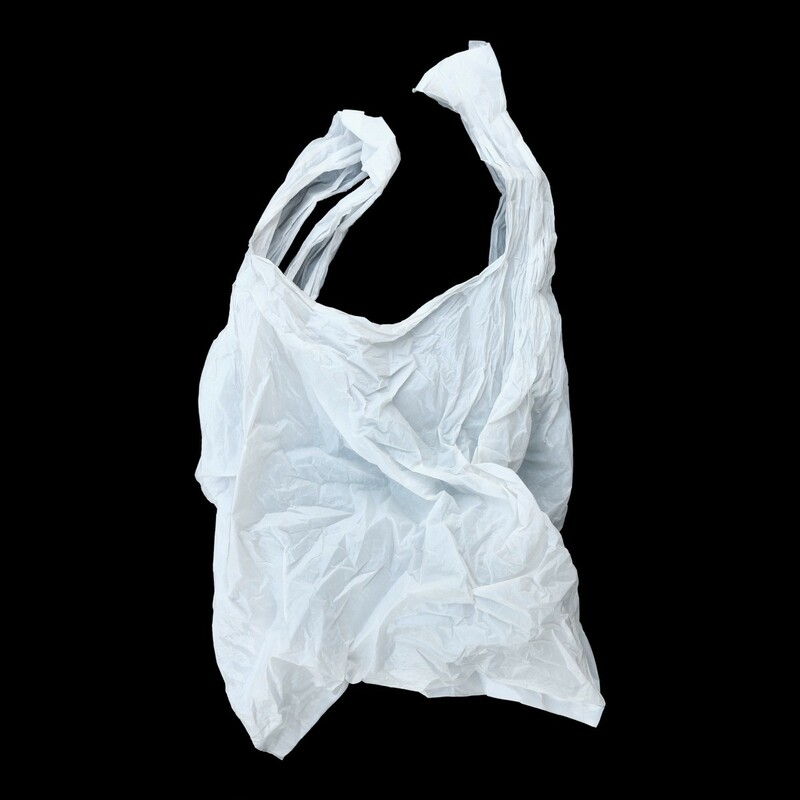 You'll always have a plastic bag when you need one and you're away from home. 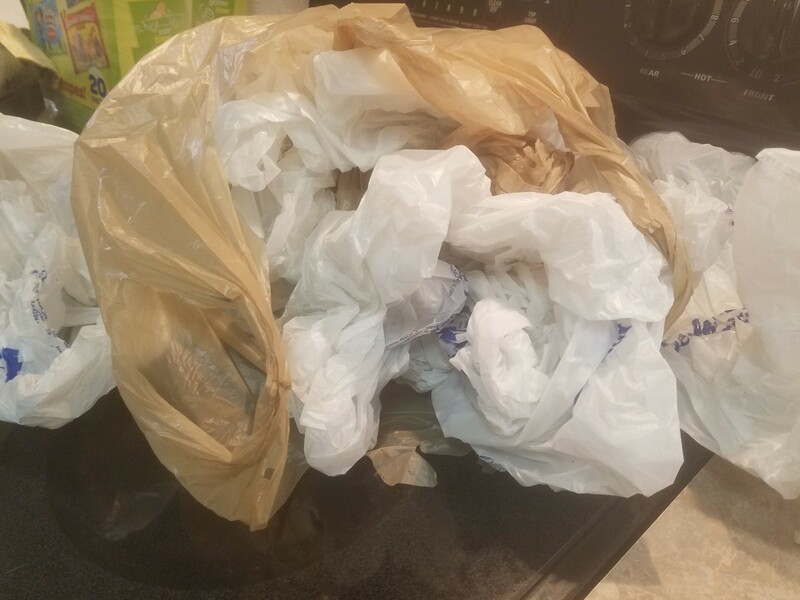 I consistently use plastic grocery bags for two things: my husband's lunch and poop patrol for my 3 large dogs. After putting the groceries away I would have a bag of bags. I tried rolling them up to put in a plastic container but it took FOREVER to it, although I did like the idea of having them neat and orderly and ready for use. Basically, this tip is to efficiently set up your supplies the way you use them and place them in a convenient spot! This takes just minutes and saves me time and aggravation. Lay out a bag, smoothing it out. Repeat for all bags until you have a stack of them. Then fold in half again. Put them in a lone bag and hang in a convenient spot. I put them in a cube in my cube holder with the gloves I use. 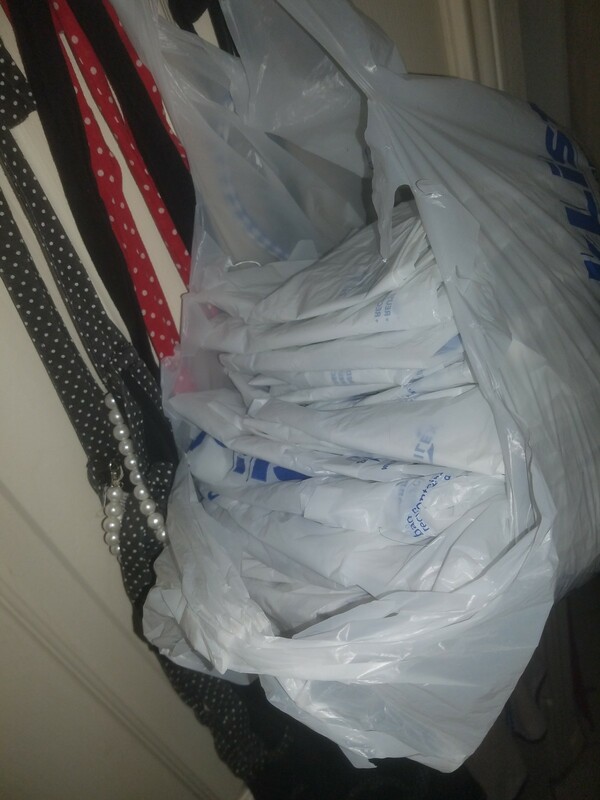 Plastic bag clutter? Quickly smooth the bag. Starting on one side, roll into a sausage. Now tie it in a single knot then tuck each end in. This takes up the space of a small baseball and is neat and tidy. A small container with a lid will keep them contained. 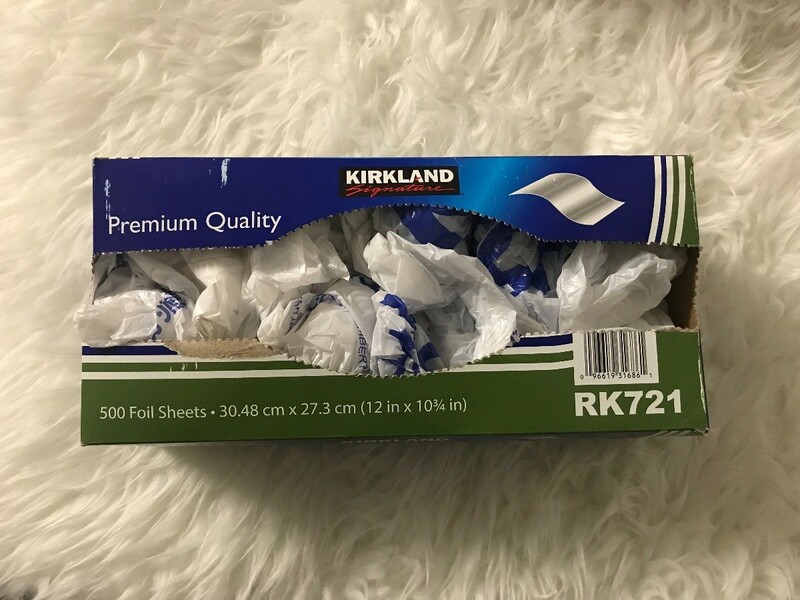 You can keep your plastic bags organized in this empty foil box. No more bags cluttering your home and keeps your plastic bags neat. If you would like, you can paint or decorate the box too but, since I store this box in the cupboard, I don't need to. I use old Kleenex boxes or wipes containers to store my plastic bags. I try to organize them by size. For the kitchen, I need larger bags to fit my waste basket. In the bathroom or for recyclables, I can use smaller sizes. Keep all your plastic bags in an empty paper towel roll. This makes it easier to access them, and keeps them organized. 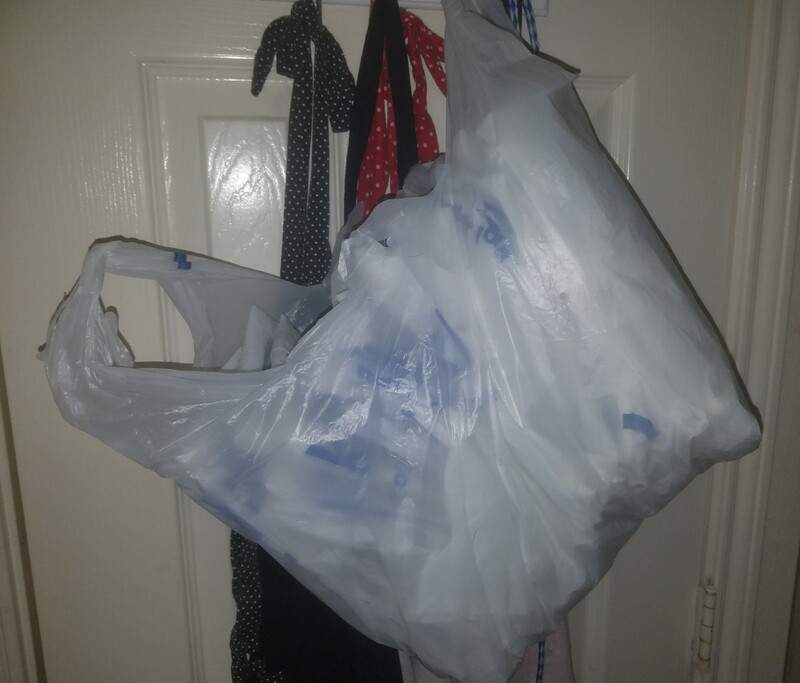 For storing plastic bags, one tip I liked was to use an unused jacket in your hall closet. 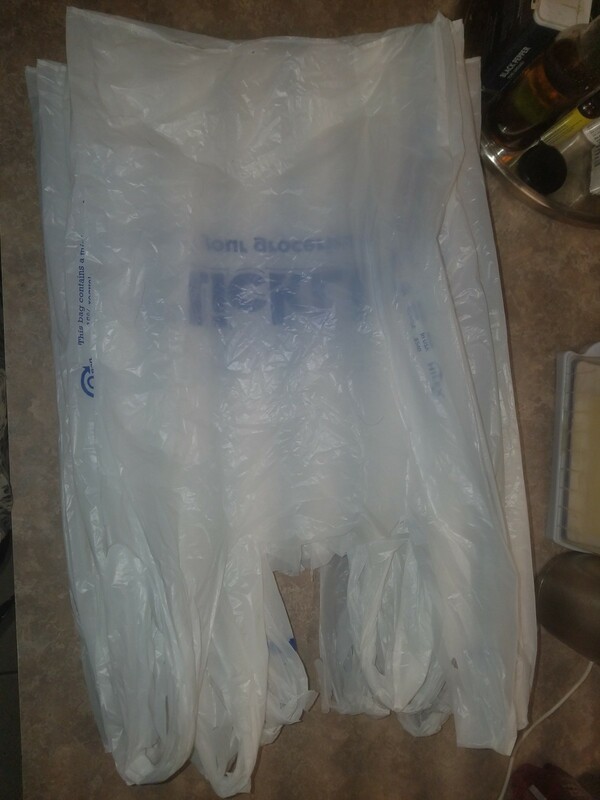 Stuff plastic bags into the sleeve facing the door. When you need one, pluck it from the sleeve cuff. Nary a problem ending up with two or three. Take a large mesh orange or grapefruit bag that has a draw string type handle from your store bought produce. Snip a bottom corner of the bag off. Insert grocery bags or cleaning rags. It hangs where you wish as well as easy pull out from bottom corner. Take a piece of fabric, fold it over and sew side. Hem each end leaving space for the draw string. Run a draw string at the top with a string to hang the container on a nail. Run elastic around the bottom and pull together. 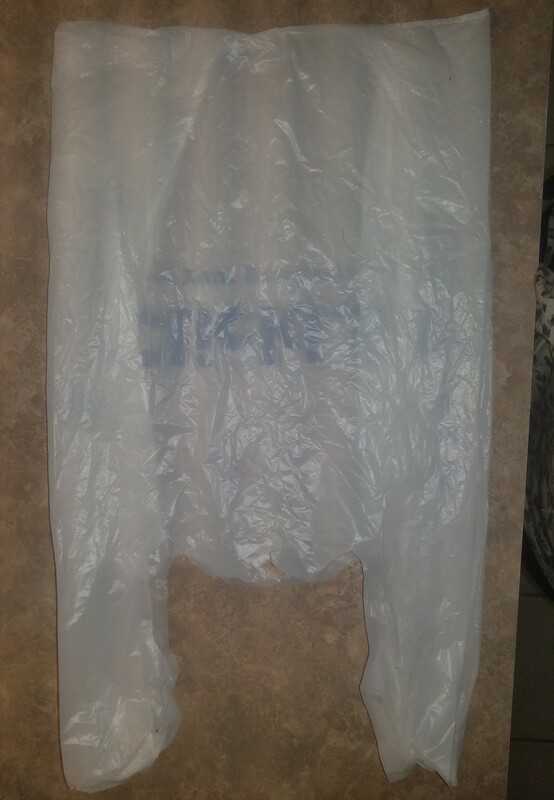 Where can I buy "storage" bags to put plastic sacks in? You can get them at almost any department store with cute designs but they are super easy to make. Take the sleeve of any long sleeved shirt. Cut a 16" length of the sleeve and turn under a 1 inch hem either sewing, with liquid fabric glue, or iron on hemming tape like stitch witch. Thread a piece of elastic, cut 1/2 the circumference of the top of the sleeve, and join the ends to make a loose stretchy top. Thread a piece of elastic 1/4 the circumference through the bottom to make a tighter stretchy hole in the bottom. Attach a little loop of ribbon and hang it on a hook either on your kitchen wall (if you can match your color scheme) or inside a cabinet door, Voila! 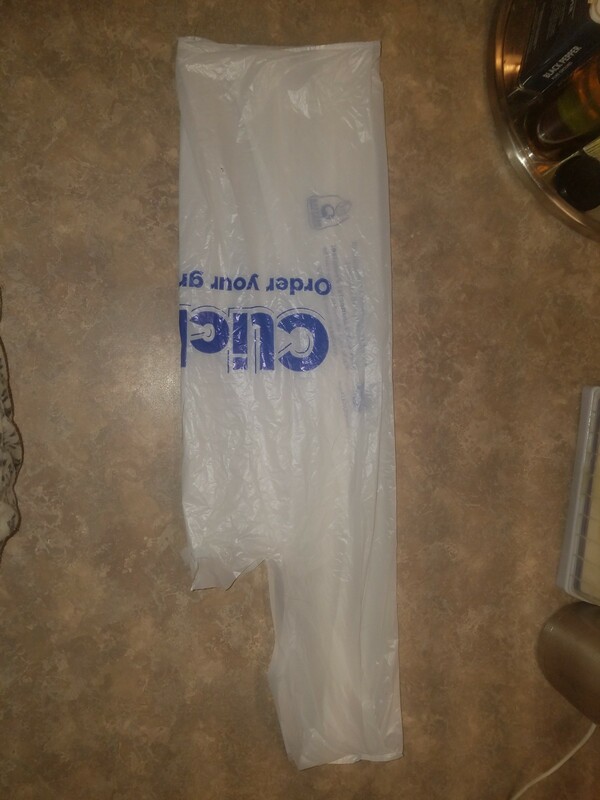 a handy, dandy plastic bag holder. Lightly stuff the bags in the top and pull out through the bottom hole. I store mine in an empty kleenex box and I find I can stack them too. Some days I just need a lot of them, other days I don't. I also like the tip from another reader about storing them in large medicine bottles and stashing in the car, purse or totes. Another place to stash them is in an empty wipes container. Good luck! An old tube sock will hold about 50 bags. I cut a small hole in the toe for dispensing. I also wad up about 4 bags in a toilet tissue tube and stash them in the car. 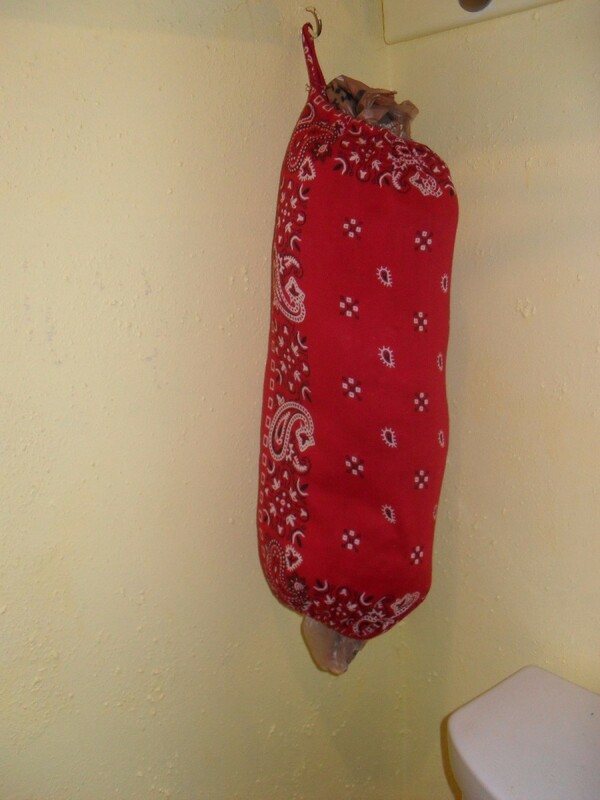 Here is a handy way to store extra plastic bags that can easily be made from a common bandana. This is a guide about bandana storage tube for plastic bags. 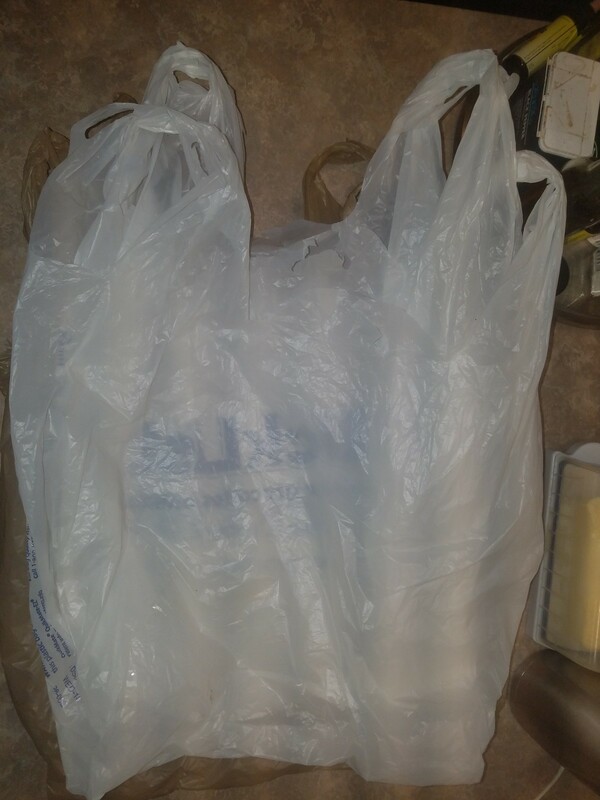 Here's a great way to store your extra plastic bags such as the ones you get at grocery stores and other stores. Fold the bag in half lengthwise (putting the handles together and lining up the bottom of the bag). Now fold again--you have a long skinny piece. Starting at the bottom of the bag, fold in thirds (like you fold a flag) until you get close to the top (where the handles are.) Secure the end (handles) into the opening that is created by this method of folding. You have a neat little triangle to store now instead of a big puffy mess of plastic. These are easier to grab out of a basket or bag than a wadded up mess of plastic. I have a three-tiered wire mesh hanging basket in my pantry--the smaller folded bags go in one basket and the larger ones go in another basket. 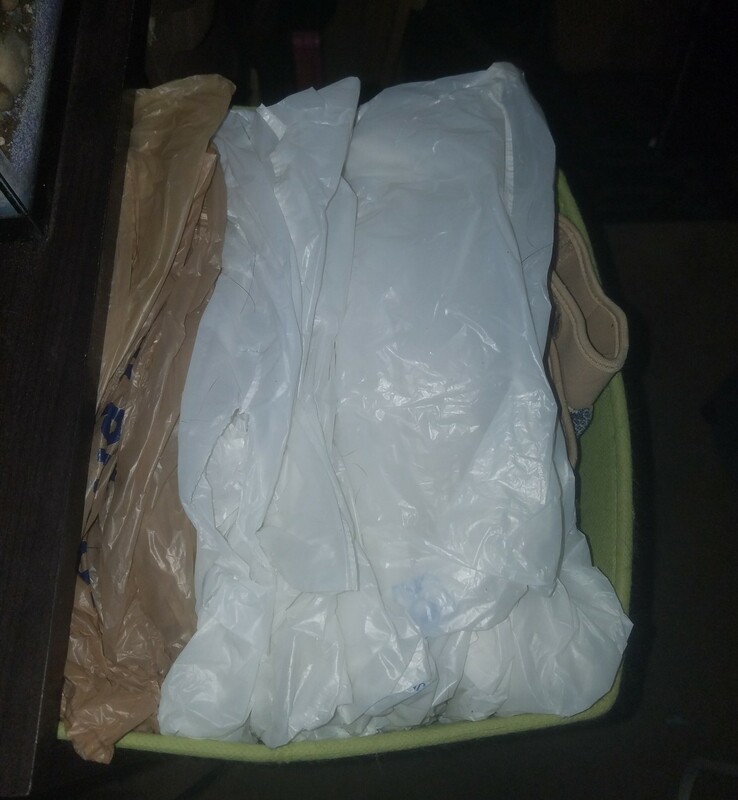 When I need a trash can liner, I grab the right size bag--no more searching through all the bags to get the size I need. 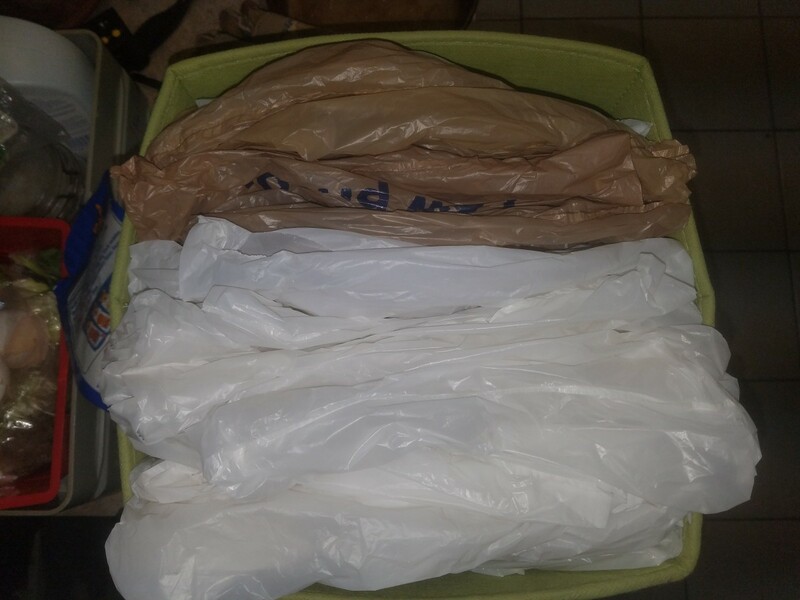 I like to save plastic grocery bags for the small trash cans in our house, and I had no place to hold them. I just could not see myself paying for something to hold these, that would be so ironic. Instead, I use a box that holds a 12 pack of can sodas, taped it up where I had to open it, and reinforced the opening where you pick it up by putting tape around it, and I ball up the bags and stuff them in. You will be surprised at how many it will hold! I also use plastic grocery bags in my smaller trashcans. 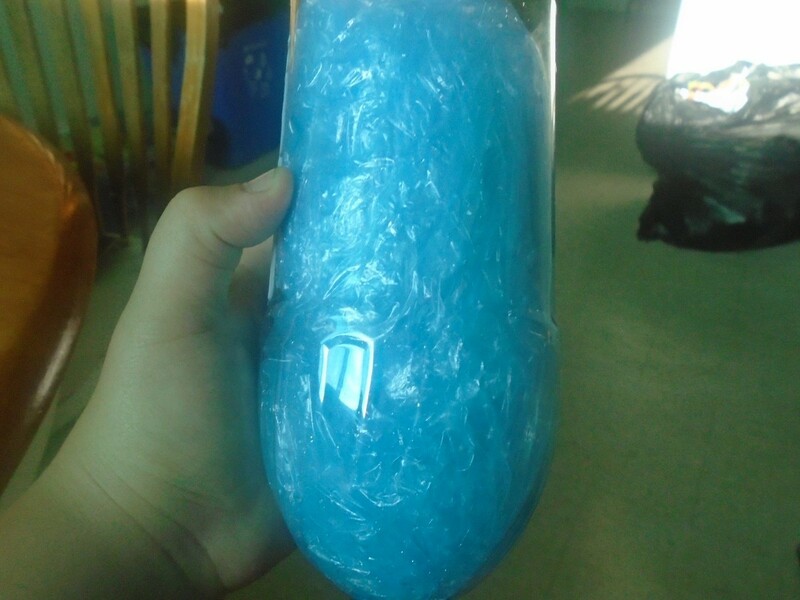 I clean out my empty gallon milk jugs and when dry replace the lid. I then cut a hole about 2-3 inches on the upper half of the jug then another slightly larger towards the bottom. As I get all those plastics bags from shopping I check to make sure they are intact (no holes or tears) then tightly wrap them around my finger (to press out any air). Then put it into the top hole in the jug. The milk carton holds an unbelievable amount of plastic bags and when your ready to reuse one you just pull one out from the bottom hole. I've labeled my jugs according to size of bags, small, medium and large, that way I don't have to pull out a bunch of bags looking for just the right size.